What is Admost and how are you positioned in the market? 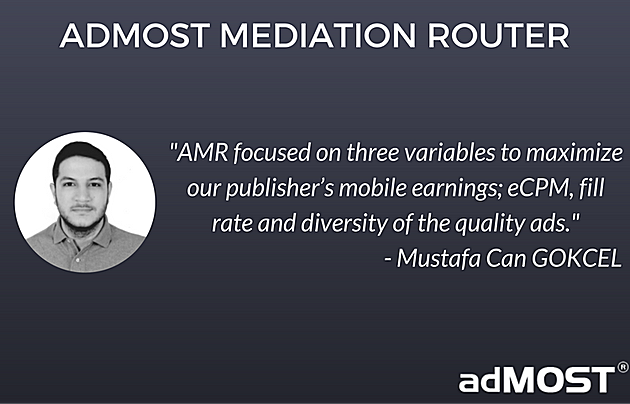 Admost Mediation Router is an only mediation tool; which optimise the various ad networks to maximise the revenue of the mobile app and game publishers. The country based automatic waterfall algorithm put the ad networks in order due to their revenue earning performance. Admost focused on three variable to maximize our publisher’s mobile earnings; eCPM, fill rate and diversity of the quality ads. We defined Admost as a router, because Admost is not a part or an extension of an ad network; only routes which ad network to serve its ads. Admost is welcoming all kind of mobile app and game publishers, all around the world. We do not have strict rules to approve a publisher to cooperate with. But, having possession of diversified GEO traffic and over $5K monthly mobile ad revenue would be better to optimize effectively. What geographies are you focused on and where are you seeing the most growth? Admost is integrated with + 30 major ad networks and newcomers are integrating continuously. Our sole purpose is to support all publishers from all around the world by cooperating the best ad networks in each country and region. What are your main tips for successful mobile monetization? Spreading your traffic (ad requests) to the multiple ad networks based on the traffic’s GEO and the ad types for distributing the high quality traffic to maximize the conversion efficiency of each ad network. Though, managing each ad network from their own dashboard regularly and manually is a really hard and demanding process. Choosing the right ad networks due to your audience’s country distribution is important for preventing the waste of your inventory with low eCPM and fill rate. There are dozens of ad networks in the market and they all want to buy your inventory to show their ads. Though, the ad network with higher return may not have sufficient amount of campaign or high volume inventory with low return, in addition with the ad networks’ periodical campaigns on specific countries. So, distributing your traffic to relevant various ad network due to your ad type and GEO would have better return for your monetization strategy. Cooperate with a powerful mediation tool rather than manual managing for your mobile monetization. Because, eCPM and the volume of inventory is fluctuating; today’s higher return ad network may not bring you the higher return tomorrow. So, the publishers need to track all the data and set adjustments of each manually. With Admost Mediation Router, the country and ad zone based automatic waterfall routes which ad network with highest return to serve its ads and also spreads your quality traffic to maximize the efficiency of each ad network for each client. Each ad network’s impression and eCPM calculation may alter; Admost counts all impression itself and calculates the optimal eCPM rates for each ad network for comparing them equally. The flexible and wieldy dashboard let you to track and manage all the detailed data from one screen. How do you differentiate Admost from other mediation tools? Most mediation tools are the extension of an ad network where they endeavor to show their own inventory to the quality traffic and backfill the rest with the others. Though, Admost is a sole friendly mediation tool between publishers and ad networks, that only routes which ad network to serve its ads. With Admost’ automatic waterfall algorithm, our publishers do not have to set any floor price or priority for any ad network. The country based waterfall automatically order the ad networks depending on their revenue return. Most of mediation systems consider the ad network’s own calculated eCPM rate and impression to create a waterfall. Though, the definition of an impression may alter in each ad network; so, the comparison of eCPM rates is like comparing apples to pears. That causes the wrong ordering in waterfall. Admost counts each impression from each ad network with same methodology and only uses the revenue data of ad networks as a base to calculate eCPM rates for comparing apples to apples. So, the order of ad networks in the waterfall is very accurate. The mediation systems with automatic waterfall order only consider eCPM rates or revenue of ad networks to make a request in order. Highest eCPM rated ad network always serve the ad first, which will cause other networks to get lower ad request and decrease in eCPM rates. Always requesting the same ad network limit the diversity of the ad and decrease the value of the placement. That will bring up lower click through rate and conversion; the efficiency of a single ad network in long term. There is no cash flow through Admost, all the payments are taken from the ad networks’ own accounts as usual. What do you think the big themes for mobile advertising are going to be in 2017? In 2017, the mobile advertising market will continue its growth with new opportunities. New players will join the competition from all around the world, though it seems big ad networks still dominate the market. The video placements seem to continue its growth with the increment on both demand/ supply side and new styles and types will come up to increase the conversion. We may see more native video types to take the attention of the users in 2017. What are your thoughts about video format exponential growth this year? Can you think of a time when all mobile ads will go video, leaving static image behind? The video format will continue its incremental growth in 2017 with new strategies and more brands transition to the digital advertising, in addition with the increasing number of publishers. But, I think that static ads will not be over due to the internet speed and data sizes and the cost of video advertising in short term.